Ms Hodgkinson said about four million juvenile Eastern king prawn larvae are currently being released, which will help boost stocks of the popular delicacy. “Catching Eastern king prawns over Christmas is one of the great family pastimes – this new program will hopefully lead to it being even more enjoyable in the future,” said Ms Hodgkinson, who visited Narrabeen Lagoon this week to help release prawns for the first time at that location. “The NSW Liberals & Nationals Government has delivered once again as part of our commitment to improving recreational fishing opportunities across the State. “The popular Eastern king prawns were bred in Queensland and are being carefully transported and stocked by the Department of Primary Industries in sites from Taree to Eden, ready for harvesting in about three months. “Local fishing clubs are assisting with the release of the prawns into suitable habitat within the estuaries to help ensure they get the best possible start. Ms Hodgkinson said the Marine Fish Stocking Program follows on from previous research trials of mulloway and prawn stocking, which evaluated the ecological aspects and effectiveness of marine stockings. “These successful stockings provided essential information for a comprehensive environmental assessment and the development of a management strategy for implementing an ongoing marine stocking program,” Ms Hodgkinson said. The Marine Fish Stocking Program builds on the existing freshwater fish stocking initiatives, funded from the NSW Recreational Fishing Trusts, which have been enhancing recreational fishing opportunities in NSW for the last 50 years. Prawn stocking locations this month include: Khappinghat Creek, Wamberal Lagoon, Narrabeen Lagoon, Swan Lake, Burrill Lake, Lake Tabourie, Bega River, Back Lake, Wallagoot Lake and Curalo Lagoon. For more information, visit www.dpi.nsw.gov.au. 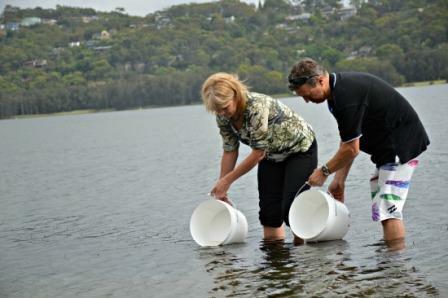 Top: NSW Minister for Primary Industries, Katrina Hodgkinson, and Narrabeen RSL Fishing Club president, Steve Law, release Eastern king prawns into Narrabeen Lagoon. Weed Eradication Detector Dogs will be deployed across the State in an effort to step up the fight against invasive plants in NSW, Minister for Primary Industries, Katrina Hodgkinson, has announced. The trained detector dogs will share in more than $1 million in funding that the NSW Liberals & Nationals Government has delivered for a new series of 14 innovative projects to find smarter ways to manage weeds across the State. “We are stepping up the fight against invasive plants in NSW as they continue to cost the State $1.8 billion in lost agricultural production and control,” Ms Hodgkinson said. “The two dogs will be trained to seek out orange hawkweed, a highly invasive weed that has been identified for eradication in NSW. “They will be carefully assessed on their ability to find the smallest weed fragments and to operate in remote and difficult terrains. “A professional dog trainer will work alongside National Parks and Wildlife Service staff and a team of volunteers as well as partners from Regional Weeds Advisory Groups, Local Land Services and the Department of Primary Industries to roll out this trial. Ms Hodgkinson said the detector dogs are just one of a number of projects being rolled out across the State to combat weeds. ”I recently announced the allocation of $11.3 million to the NSW Weeds Action Program for 2014-15, which is now well underway,” Ms Hodgkinson said. “The first $10.1 million component of this funding has been delivered across the State and we’ve now allocated more than $1 million dollars to innovative projects as part of the highly effective and popular program. An application for the Moolarben Coal Mine Stage 2 project has been referred to the Planning Assessment Commission (PAC). extracting an extra 16 million tonnes of coal per year for 24 years, bringing the total for the entire mine to 28 million tonnes per year until the end of 2038 constructing supporting facilities and utilities an associated application to modify the existing first stage of the mine so both stages can operate as one. The application for the proposal says it would create 120 ongoing, full-time jobs and another 220 during construction as well as contributing more than $150 million in taxes and royalties to the NSW and Australian governments during construction and operation. “A public hearing was held by the PAC during its initial merit review, where 51 presentations were made by the community and government agencies,” a spokesperson for the Department of Planning and Environment said. To view the Department’s assessment,visit the Major Projects website at majorprojects.planning.nsw.gov.au. UNSW's solar researchers have converted over 40% of the sunlight hitting a solar system into electricity, the highest efficiency ever reported. The world-beating efficiency was achieved in outdoor tests in Sydney, before being independently confirmed by the National Renewable Energy Laboratory (NREL) at their outdoor test facility in the United States. “This is the highest efficiency ever reported for sunlight conversion into electricity,” UNSW Scientia Professor and Director of the Australian Centre for Advanced Photovoltaics (ACAP) Professor Martin Green said. The 40% efficiency milestone is the latest in a long line of achievements by UNSW solar researchers spanning four decades. These include the first photovoltaic system to convert sunlight to electricity with over 20% efficiency in 1989, with the new result doubling this performance. “The new results are based on the use of focused sunlight, and are particularly relevant to photovoltaic power towers being developed in Australia,” Professor Green said. Power towers are being developed by Australian company, RayGen Resources, which provided design and technical support for the high efficiency prototype. Another partner in the research was Spectrolab, a US–based company that provided some of the cells used in the project. A key part of the prototype’s design is the use of a custom optical bandpass filter to capture sunlight that is normally wasted by commercial solar cells on towers and convert it to electricity at a higher efficiency than the solar cells themselves ever could. Such filters reflect particular wavelengths of light while transmitting others. ARENA CEO Ivor Frischknecht said the achievement is another world first for Australian research and development and further demonstrates the value of investing in Australia’s renewable energy ingenuity. The 40% efficiency achievement is outlined in a paper expected to be published soon by the Progress in Photovoltaics journal. It will also be presented at the Australian PV Institute’s Asia-Pacific Solar Research Conference, which begins at UNSW today (Monday 8 December). Known as the ‘Father of photovoltaics’, Martin Green is a Scientia Professor at UNSW and Director of the Australian National Energy Agency-supported Centre for Advanced Photovoltaics. He was formerly a Director of CSG Solar, a company formed specifically to commercialise the University’s thin-film, polycrystalline-silicon-on-glass solar cell. His group's contributions to photovoltaics are well known including the development of the world’s highest efficiency silicon solar cells and the successes of several spin-off companies. 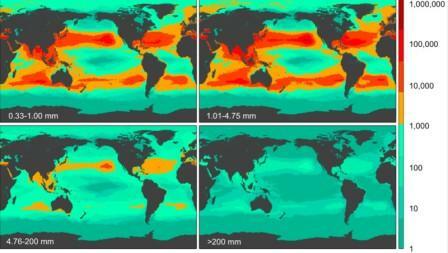 December 10, 2014 - Nearly 269,000 tons of plastic pollution may be floating in the world's oceans, according to a study published December 10, 2014 in the open-access journal PLOS ONE by Marcus Eriksen from Five Gyres Institute and colleagues. Microplastic pollution is found in varying concentrations throughout the oceans, but estimates of the global abundance and weight of floating plastics, both micro and macroplastic, lack sufficient data to support them. To better estimate the total number of plastic particles and their weight floating in the world's oceans, scientists from six countries contributed data from 24 expeditions collected over a six-year period from 2007-2013 across all five sub-tropical gyres, coastal Australia, Bay of Bengal, and the Mediterranean Sea. The data included information about microplastics collected using nets and large plastic debris from visual surveys, which were then used to calibrate an ocean model of plastic distribution. Based on the data and model, the authors of the study estimate a minimum of 5.25 trillion plastic particles weighing nearly 269,000 tons in the world's oceans. Large plastics appear to be abundant near coastlines, degrading into microplastics in the 5 subtropical gyres, and that the smallest microplastics were present in more remote regions, such as the subpolar gyres, which the authors did not expect. The distribution of the smallest microplastics in remote regions of the ocean may suggest that gyres act as 'shredders' of large plastic items into microplastics, after which they eject them across the ocean. 25 Nov 2014 - The Department of Planning and Environment today released draft criteria for private certifiers who will speed up the delivery of vital port infrastructure at the State’s three major ports. The proposed criteria requires specialist engineers to certify infrastructure at Port Botany, Port Kembla and the Port of Newcastle.  bulk liquid storage tanks. “Currently only a number of councils are able to approve port infrastructure, which will affect the ramp up of new infrastructure at our ports,” a Department spokesperson said. “Without help from private certifiers, these works could be delayed, reducing the productivity of our ports – and that’s bad news for the NSW economy. Major port projects such as large-scale dredging work and new berths will continue to be assessed by the Department of Planning and Environment. The spokesperson said it was critical that port operators continued to upgrade and expand infrastructure to respond to growing demand for goods across the state. “Our three key ports in Sydney, Newcastle and the Illawarra receive about 99 per cent of more than 180 million tonnes of freight goods which is imported to NSW each year,” The spokesperson said. The Building Professionals Board is seeking feedback on proposed criteria for the accreditation of certifiers in the A5 category until 19 December 2014. Over the past 12 months Sea Shepherd Australia has been able to achieve so much with your support. Thank you for all your help defending sharks, whales and the weird and wonderful toothfish. Together we have and will continue to make a difference for the oceans, its marine life and for ourselves. Merry Christmas for 2014! World leading research funded by the NSW Government is now available to communities, with climate projections out to 2070 and down to the nearest 10 kilometres, allowing the community to base adaptation decisions on the best available science. Environment Minister Rob Stokes today said the new data had been developed following a research partnership between the NSW and ACT governments and climate modellers at the University of NSW Climate Change Research Centre. “The development of this information was a commitment from the NSW Government as part of the NSW 2021 state plan, and it is an important duty for a responsible government to help communities understand future risk,” Mr Stokes said. “Individuals and local government will be able to access the information through the NSW Government’s new interactive climate information portal which gives information simply by entering a location. “Our role is to deliver the best available climate information and make it accessible to local decision makers so they can decide what actions are appropriate to minimise the potential risks of climate change. “We’ve spoken to farmers and councils across the state who have said the portal will provide valuable information for long term planning of their business and development. “This portal will be part of a continuing release of information about how climate will impact soils, biodiversity, bushfires, coastal impacts and flooding. “The NSW Government had formed partnerships with several NSW universities to develop our research on how to adapt to climate change. “Climate change adaptation is all about the ability of our regional communities to respond, adapt and take up opportunities. • Increases in severe fire weather days during spring may increase bushfire risk and reduce opportunities for hazard reduction burning. Minister for Primary Industries, Katrina Hodgkinson, has announced that a pest control order for foxes has been introduced for the first time in NSW. “The Local Land Services (European Red Fox) Pest Control Order 2014 will be gazetted, meaning foxes are now a declared pest species in this State,” Ms Hodgkinson said. “The introduction of the pest control order brings NSW into line with all other States in Australia in ensuring that foxes must be controlled by landholders on their properties. “Importantly, the pest control order will allow for additional options for coordinated control, meaning Local Land Services can more effectively target foxes in localised campaigns. “It also means no newly acquired foxes will be allowed to be kept in captivity, and those people that currently keep foxes in captivity will be required to apply for a permit from Local Land Services. Ms Hodgkinson said the draft pest control order was released for public comment in October, with 1785 submissions received, the majority of which were in favour. “All issues raised in the submissions were carefully considered before a final decision was reached,” Ms Hodgkinson said. “It is clear that this pest control order will benefit landholders and the wider community by improving the coordinated control of this invasive predator. “With the total annual cost of foxes to Australia’s environment and economy estimated to be $227.5 million, the pest control order will assist in the coordination of successful communitywide fox control programs. The pest control order can be viewed atwww.dpi.nsw.gov.au/biosecurity. The Australian Government today announced the successful organisations to lead research hubs under the $142.5 million National Environmental Science Programme. The programme will assist decision-makers to understand, manage and conserve Australia's environment by funding world-class biodiversity and climate science. This research will ensure decisions about managing Australia's biodiversity and environmental resources are made on the best available information. The National Environmental Science Programme is a competitive merit-based programme with six research hubs. • the Clean Air and Urban Landscapes Hub will support environmental quality in urban areas with funding of $8.88 million through the University of Melbourne, led by Professor Peter Rayner. • the Earth Systems Hub will further our understanding of the drivers of Australia's climate with funding of $23.9 million through the CSIRO, led by Dr Helen Cleugh. • the Marine Biodiversity Hub will research Australian oceans and marine environments, including temperate coastal water quality and marine species, with funding of $23.88 million through the University of Tasmania, led by Professor Nic Bax. • the Northern Australia Environmental Resources Hub will support the sustainable development of our northern landscapes with funding of $23.88 million through Charles Darwin University, led by Professor Michael Douglas. • the Threatened Species Recovery Hub will support the management of threats and improving recovery of threatened species with funding of $29.98 million through the University of Queensland, led by Professor Hugh Possingham. • the Tropical Water Quality Hub will research coastal water quality and coastal management focused on the Great Barrier Reef and other tropical waters with funding of $31.98 million through the Reef and Rainforest Research Centre, led by Professor Hurriyet Babacan. The hub leaders are recognised international scholars, who come with teams of high calibre researchers from across Australia's research institutions. The research partners all have impressive track records of delivering practical science that has informed the direction of environmental science across many decades. The proposed six years of funding under the National Environmental Science Programme will provide certainty to researchers so that science programmes can be planned and completed in a way which ensures flexibility and alignment with current environmental policy needs. The Government is committed to integrating science into decision-making as a key principle of good environmental policy. Important Bird and Biodiversity Areas (IBAs) are sites of global bird conservation importance. Unfortunately, five of these sites in Australia risk being lost forever due to the effects of fires, unsustainable farming practices, increased industrial development and introduced species. This places the threatened bird species that rely on these places at high risk of extinction. Sign on to BirdLife Australia’s campaign to help protect these areas of global conservation importance before it’s too late. At the recent World Parks Congress, which focused International attention on conservation in Australia, BirdLife Australia launched a report outlining straight forward actions that can be taken to recover the value of these IBAs. Now we just need our governments to commit to these actions! Please join us in urging our state and federal governments to take action to protect and restore these sites of global bird conservation importance. Thank you for supporting our efforts to help protect Australia’s birds. 12 December 2014 - Students who used school-issued laptop computers at school and home perform better in their HSC science exams than those not given the computers, research from the University of Sydney has shown. "While improvements are small to medium they are statistically significant, particularly in the context of highly competitive HSC exams where a margin of a few marks can affect a student's future at university or in the job market," said Simon Crook, a PhD candidate in the physics education research group at the University of Sydney and lead author of an article recently published in the International Journal of Science Education. "Most importantly our research suggests the best improvements came when the computers were used to challenge and extend students' analytical and higher-order thinking skills." While there is widespread research on the impact of using laptops on students' motivation, there is a lack of research on their influence on academic achievement, especially for science. The study capitalised on a unique natural experiment in which only half of Year 9 NSW students in 2008 received laptops from their schools. In late 2011, when these students sat their HSC examinations half of them had been schooled with their own laptops for more than three years, and half had not. This unique situation was created by the staged roll-out of the campaign, the Digital Education Revolution, in which students were given their own laptops to use at home and school. The research looked at the results of 967 science students from 12 high schools in Sydney, in HSC biology, chemistry and physics. Effect size measures the improvement in the students' performance following an intervention, in this case laptops. In this study the improvement was largest in physics - almost double the average effect size for reducing class sizes, as found in other research. Applied to HSC marks, the effect size would see a possible gain of 3.5 marks for physics. "Our analysis shows improved exam performance was not due to how much students used their computers but what they did with them," said Simon Crook. The laptop gifting policy appears to have been a catalyst for more student-centered and personalised learning. Specifically it would appear the results in physics were associated with the increased use of simulations and spreadsheets, activities associated with higher-order thinking skills, especially beneficial to the study of science. "Simulations,(such as the Thomson's experiment simulation created by the University of Sydney) allow students to understand and participate in experiments that are too difficult or dangerous to perform at school or are inaccessible because of their conceptual complexity. Spreadsheets encourage an intellectually demanding level of student interaction with their own experimental data. "The question of why physics teachers have embraced these materials more than teachers in other science subjects appears to relate to their intrinsic skills in this area and the explicit demands of the physics curriculum which has resulted in collaboration and the sharing of these digital resources." The authors on the article are Simon Crook and Associate Professor Manju Sharma from the School of Physics and Dr Rachel Wilson from the Faculty of Education and Social Work. 9 December 2014 - The film Jaws has heavily influenced Western Australia's stance on sharks, a review of over a decade of state government policy has found. Dr Christopher Neff of the University of Sydney has examined the narratives and shark hunt policies implemented by different WA Governments between 2000 and 2014 and found striking similarities to the 1975 Spielberg classic. "In particular, the Western Australian Government's current 'Imminent Threat' policy to catch and kill 'rogue' sharks is predicated on Hollywood fiction," says Dr Neff, a lecturer in public policy at the University's Department of Government and International Relations. In October this year, the West Australian government withdrew an application to the federal government to extend its drumline policy, albeit securing permission to kill sharks deemed by the government to pose 'imminent threat' to beachgoers. "This policy is using myths as the basis for killing sharks that are protected by law and which provides no real beach safety," says Dr Neff. "This fiction serves an important political purpose because films allow politicians to rely on familiar narratives following shark bites to blame individual sharks in order to make the events governable and to trump evidence-based science." "The message from this research is that politicians do not have a right to their own set of scientific facts about sharks, no matter how popular the movie." Dr Neff's research, which has been published online in the Australian Journal of Political Science, spells out the Jaws Effect as a political device based on three themes from the film: the intentionality of sharks, the perception that all human-shark incidences are fatal and the idea that killing 'the shark' is the only solution. "Unpacking the politics of shark bites, or any public policy issue, involves addressing the way words and images are used to paint a picture for the public and inform policy choices. This research therefore offers broader implications for policy analysis," says Dr Neff. "[It] identifies a worrying style of policymaking where widely known fiction can be used to navigate the attribution of blame and to prescribe policy responses," he says. 8 December 2014 - The most comprehensive worldwide review ever conducted of programs designed to prevent young people becoming overweight has identified serious flaws with their design and implementation. The University of Sydney research, recently published in the highly respected Obesity Reviews highlighted that most existing studies do not record enough relevant data to enable them to be used by the community. Previous research has shown that on average Australian adults aged 25-34 gained 6.7 kilograms over ten years, more than any other age group according to Professor Margaret Allman-Farinelli, an author on the study and from the University's School of Molecular Bioscience and Charles Perkins Centre. "It is young adults, not the middle-aged or elderly, who record the biggest weight gains of any adult group and therefore run accelerating risks of associated early onset chronic diseases." "A crucial part of addressing the obesity crisis is to therefore create effective lifestyle campaigns to prevent young adults becoming increasingly overweight." The research, with leading author PhD student Stephanie Partridge, reviewed 21 peer-reviewed publications on weight-gain prevention trials from four continents, including Australia, targeting 18-to-35 year-olds. Half of the trials showed weight control in the short term. But only four studied maintenance for more than six months and none of these were Australian. Most of the weight-gain prevention trials failed to report data that would allow governments or private health services to successfully implement programs in the wider community. "Important details which would be crucial to making a decision on whether and how to run the program were not recorded. Missing information included costs, how young adults were recruited to programs, the profession and skills of those who delivered programs, and the socioeconomic, educational and ethnic background of the participants," said Professor Allman-Farinelli. Researchers need to remember to collect the information that would enable health services to evaluate the pros and cons of implementing their program and not just report on the success of their program the study concludes. "Whether the effects of the program are the same when more than one person delivers it, whether it works in rural and urban settings, if some components of the program are not critical to success and just what the participants think about it - all need to be evaluated and reported," said Professor Allman-Farinelli. "We are failing our young people and contributing to the looming healthcare crisis which estimates put as high as 60 percent of the worldwide population being overweight by 2030 if we don't come up with effectively designed programs to use in Australia and elsewhere. "We need to fund large-scale, long-term research that provides the answers we need." 10 December 2014 - Professor Rodney Phillips, an eminent Australian academic who is currently a Vice-Dean of Medical Sciences at Oxford, has been appointed Dean of Medicine at UNSW, Vice-Chancellor Professor Fred Hilmer announced today. Professor Phillips holds senior research Directorships at Oxford, as well as serving as a Vice-Dean of the university’s Medical Sciences Division. A recipient of numerous awards, he has had a distinguished career as a clinician, researcher and medical administrator in the UK since leaving Australia some 30 years ago. Professor Phillips will take up the appointment in mid-2015. He will replace Professor Peter Smith, who is stepping down as Dean after 10 years in the role. “This is an outstanding appointment for UNSW,” Professor Hilmer said. “Oxford’s medical faculty is ranked as one of the top two in the world and is the largest in Europe for research income and infrastructure. Professor Phillips plays a critical role in helping to lead that Division, while continuing his work as a research leader. The appointment has been warmly welcomed by UNSW’s incoming Vice-Chancellor, Professor Ian Jacobs. Professor Jacobs, currently Vice-President and Dean of the Faculty of Medical and Human Sciences at the University of Manchester, is due to join UNSW in February 2015. “UNSW Medicine is one of Australia’s great medical schools,” Professor Jacobs said. “It is recognised as a leading centre for medical and health related education and research. Professor Phillips holds an MBBS and an MD from the University of Melbourne and an MA from Oxford. He began his career as a physician at the Royal Melbourne Hospital before moving to Guy’s Hospital in London in 1981. He joined Oxford University as a lecturer in 1983, was appointed Professor of Medicine in 1997 and went on to become Head of Research and Associate Dean of the University’s Division of Medical Sciences. He took up his current position as Vice-Dean in 2011. Professor Phillips is Director of the Peter Medawar Building for Pathogen Research at Oxford and Co-Director of the Oxford Martin Institute for Emerging Infection, a unit aimed at investigating pandemic viral infections. His personal research is focused on HIV/AIDS: his Oxford group was the first to define the mechanism through which HIV evades human immunity. He is a Fellow of the Royal Australasian College of Physicians, the Royal College of Physicians (London) and the Academy of Medical Sciences, and a Fellow by special election of Oxford’s Pembroke College. The Australian National Soil Archive contains about 70,000 samples from almost 10,000 sites across Australia, the oldest dating back to 1924. In this video, archive manager Peter Wilson explains why these "time capsules" of the Australian landscape are so important to our future. Wednesday 10 December 2014 - Six Australian projects have been invited to screen at the renowned Sundance Film Festival in 2015. South Australian Closer Productions’ Sam Klemke’s Time Machine will have its world premiere in the New Frontier Film section and Oscar Raby’s Assent will screen in the New Frontier Installations section. Two short films, Kitty Green’s The Face of Ukraine: Casting Oksana Baiul and Tim Marshall’s Followers, will premiere to the world in the Sundance Shorts Competition. Previously announced feature films, Kim Farrant’s Strangerland (Nicole Kidman, Joseph Fiennes, Hugo Weaving) and Ariel Kleiman’s Partisan (Vincent Cassel) will screen in competition in the World Cinema Dramatic program. Sam Klemke’s Time Machine is about an obsessive filmmaker, Sam Klemke, who in 1977, aged 17, set out to record himself every year until his death. Sam filmed and narrated 50 years of his life, creating a strange and intimate portrait of what it means to be human. The film was written and directed by Matthew Bate, previously invited to Sundance Film Festival for his feature documentary Shut Up Little Man! An Audio Misadventure, and produced by Rebecca Summerton. Award-winning Assent is an immersive documentary using virtual reality technology to put the user in the footsteps of director Oscar Raby’s father, who in 1973, was a 22-year-old army officer stationed in the north of Chile, on the day when the Caravan of Death came to his regiment. The film screened at the International Documentary Film Festival Amsterdam and won the Audience Cross-Platform Award at Sheffield International Documentary Festival this year. The project was written, directed and produced by Oscar Raby. The Face of Ukraine: Casting Oksana Baiul comes from the filmmakers of award-winning documentary Ukraine is Not a Brothel. The short film was written and directed by Kitty Green and produced by Kitty Green, Philippa Campey and Michael Latham. The film, set in divided and war-torn Ukraine, tells the story of little girls adorned in pink sequins auditioning to play the role of gold medal–winning figure skater Oksana Baiul – whose tears of joy once united their troubled country. Screen Australia supported Partisan, Strangerland, Sam Klemke’s Time Machine and The Face of Ukraine: Casting Oksana Baiul through development and or production funding. The Australian contingent will also be represented by Margot Robbie in Z for Zachariah, Guy Pearce in Results, Ben Mendelsohn in Mississippi Grind and also in Slow West with Kodi Smit-McPhee and producer Emile Sherman, Bojana Novakovic in The Hallow from Ireland and Toni Collette in Glassland. The annual Sundance Film Festival is part of the Sundance Institute founded by Robert Redford in 1981. The festival is internationally recognised for its discovery and support of independent films from around the world. It has showcased many Australian films including Young Love, Deeper Than Yesterday, The Babadook, 52 Tuesdays, Top of the Lake, Wish You Were Here, The Square, Mad Bastards, Shut Up Little Man! An Audio Misadventure, Bran Nue Dae and Animal Kingdom. The Sundance Film Festival will take place 22 January – 1 February 2015. December 9, 2014 - With the holidays around the corner, we're all a little more likely to indulge, especially when it comes to alcohol. While a few extra drinks might be brushed off as holiday cheer, they can actually signal a problem in young adults. That's because the bad habits we pick up in our youth may stay with us later in life, according to a new study from Concordia, in collaboration with the Université de Montréal and University of Massachusetts. Its findings, which were published recently in the journal Alcoholism: Clinical and Experimental Research, suggest that teenagers who regularly consume alcohol are more likely to binge drink, at least into their mid-20s. Furthermore, young men -- those who left formal education behind at an early age and those who have a tendency toward impulsive behavior -- are more likely to sustain the drinking habits they formed in adolescence. "Most people don't even know when they're binge drinking," says Erin O'Loughlin, a co-author of the study and researcher with Concordia's Independent Program (INDI) and Department of Exercise Science. "While they do know when they are wasted, the reality is that four consecutive drinks per sitting for a woman and five for a man constitutes binge drinking. And that means society is more tolerant of binge drinking than we think." This lack of understanding what binge drinking actually is means that youth may not be tuned into how their personal habits are a cause for concern. These new findings emerged from the Nicotine Dependence in Teens (NDIT) Study, in which several Concordia researchers are involved. NDIT has been keeping tabs on the mental health, drinking habits and physical activity levels of 1,294 young people from the Montreal area since 1999, when they were 12 or 13 years old. The NDIT study, which gathered data that can be used to study the relationship between alcohol consumption and health, suggests that of the 85 per cent of respondents who continue their heavy-drinking habits into early adulthood, some may face long-term consequences. As this study suggests, the perception that binge drinking is something that adolescents are bound to grow out of does not match reality. "Parents should be aware that if their teenager is binge drinking, they are more likely to sustain binging later in life," says O'Loughlin. "This challenges the belief that being exposed to alcohol early on means they will be protected from alcohol-related problems when they grow up." "But just as a parent would never give their child a cigarette to try, the same view should perhaps apply to alcohol. Delaying that first taste of alcohol might be the best thing you can do -- even if it's New Year's Eve." 12 December 2014 - Radical treatments for prostate cancer could be avoided thanks to new research that links fat cells and obesity with the most common cancer among Australian men. Led by the University of Adelaide, and including researchers from the University of Sydney's Charles Perkins Centre, the Ludwig Institute for Cancer Research in Melbourne and KU Leuven in Belgium, a new multi-centre Australian research team believes the makeup of lipids in the prostate gland could indicate whether and how prostate tumours will respond to treatment. They have received a $3.25 million Revolutionary Team Award from the Movember Foundation and the Prostate Cancer Foundation of Australia over the next three years. "The current treatments for early stage prostate cancer are very effective in eliminating cancer, but they also have major side effects that impact on quality of life," said Dr Andrew Hoy, from the University of Sydney's Charles Perkins Centre and Sydney Medical School. "The key question is: does every man with prostate cancer need to go through that kind of radical therapy?" As part of the Team Award, Dr Hoy's group at the University of Sydney is examining the impact of obesity on prostate cancer risk and the aggressiveness of prostate cancer tumours. "Obesity doesn't necessarily increase your chances of getting cancer, but if you are obese and you do develop cancer, it is more likely to be fatal," Dr Hoy said. "Obese people also seem to be less responsive to our current therapies for cancer. This means that as more and more of our population becomes obese, our strategies for managing prostate cancer will have to adapt." According to Dr Hoy, the amount of fat around the prostate is a marker of disease aggressiveness. Furthermore, the types of fats (polyunsaturated, monounsaturated or saturated fats) dictate how the tumour cells will respond to treatment. By better understanding the influence of these fats on the behaviour of the cancer cells, the team hopes to improve the diagnosis of prostate cancer in the short term, enhance current treatments and develop new treatments in the long term. "We think that these fat cells are providing a fuel tank for prostate cancer tumours. Given the tank of energy is much larger in obesity, the cancer cells have the potential to be much more aggressive and resistant to treatment. "Thanks to the Movember Revolutionary Team Award, we can harness the collective new knowledge from the University of Adelaide, the University of Sydney, the Ludwig Institute for Cancer Research and KU Leuven to detect these fats using state-of-the-art imaging technologies with the goal of making a direct impact on clinical care for prostate cancer patients worldwide. "With our findings, we aim to be able to determine whether a man needs treatment or not and, if he does, to quickly assess if it is working. Ultimately this will better differentiate the types of cancer that for many men in Australia and around the world are currently being over-treated," Dr Hoy said. Paul Villanti, the Movember Foundation's Executive Director of Programs, said the research will be the first of its kind and help men living with and beyond prostate cancer have the treatment and care needed to be physically and mentally well. "Involving a trans-disciplinary team of experts at the forefront of their respective fields, this program will provide the first proof of whether such an approach can improve or add to the clinician's toolkit in predicting tumour behaviour and patient outcomes," Villanti said. 10 December 2014 - The Government has today announced new measures to ensure Australians make informed choices when accessing online content and to strengthen the industry’s ability to tackle online copyright infringement. Copyright protection provides an essential mechanism for ensuring the viability and success of creative industries by incentivising and rewarding creators. The rapid growth of the Internet has brought significant challenges to the protection of copyright, due to the ease with which material can be digitally copied and shared, at little or no cost. The Government has sought the least burdensome and most flexible way of responding to concerns about online copyright infringement, while protecting the legitimate interests of the rights holders in the protection of their intellectual property. The Attorney-General and the Minister for Communications have written to industry leaders requiring them to immediately develop an industry code with a view to registration by the Australian Communications and Media Authority (ACMA) under Part 6 of the Telecommunications Act 1997. The code will include a process to notify consumers when a copyright breach has occurred and provide information on how they can gain access to legitimate content. The Minister and the Attorney-General expect strong collaboration between rights holders, internet service providers (ISPs) and consumers on this issue. A copy of the letter to the industry leaders is attached. Failing agreement within 120 days, the Government will impose binding arrangements either by an industry code prescribed by the Attorney-General under the Copyright Act 1968 or an industry standard prescribed by the ACMA, at the direction of the Minister for Communications under the Telecommunications Act. The Government will also amend the Copyright Act, to enable rights holders to apply for a court order requiring ISPs to block access to a website, operated outside of Australia, which provides access to infringing content. In a world of rapid changes in technology and human behaviour, there is no single measure that can eliminate online copyright infringement. In light of this the Government will review the measures, 18 months after they are implemented, to assess their effectiveness. These measures, to be introduced in early 2015, follow extensive consultation with industry and consumer groups and evaluation of submissions to the Online Copyright Infringement Discussion Paper. Over the course of this year, we have been discussing the best ways to reduce the high levels of online copyright infringement in Australia. We thank you for your input and co-operation in this process of consultation. The Government recognises that addressing online copyright infringement is a complex task with shared responsibility between rights holders, internet service providers (ISPs) and consumers. We also appreciate that this is a dynamic issue, affected by changing technology and consumer behaviour. As such, the Government has sought the least burdensome and most flexible way of responding to concerns about online copyright infringement, while protecting the legitimate interests of the rights holders in the protection of their intellectual property. The Government understands the unique position of ISPs with respect to assisting rights holders to identify and communicate with people alleged to have infringed copyright. We recognise that, for various reasons, agreement has not been reached between rights holders and ISPs on efforts to address online copyright infringement. To overcome this, the Government asks that ISPs and rights holders develop a code with a view to registration by the Australian Communications and Media Authority (ACMA) under Part 6 of the Telecommunications Act 1997 (the Telecommunications Act). We note that the existence of a code will be central to a court’s assessment of whether a party has taken “reasonable steps” under sections 36 or 101 of the Copyright Act 1968 (the Copyright Act) for the purposes of authorisation liability. • include a process for facilitated discovery to assist rights holders in taking direct copyright infringement action against a subscriber after an agreed number of notices. If an industry code is not agreed by 8 April 2015, the Cabinet has determined that the Government will prescribe binding arrangements either by an industry code prescribed by the Attorney-General under the Copyright Act or an industry standard prescribed by the ACMA, at the direction of the Minister for Communications under the Telecommunications Act, on such terms as agreed by us. The Government has also decided to introduce legislation that will enable a court to order the blocking of overseas hosted websites that can be shown to be primarily for the purpose of facilitating online copyright infringement. The issue of price and availability of legitimate content in Australia was a key factor raised in the majority of submissions to the Online Copyright Infringement Discussion Paper. The Government notes recent efforts by the industry in this area, and expects industry to continue to respond to this demand from consumers in the digital market. The Government accepts that there is no single proven course of action to reduce levels of online copyright infringement and that as technology and consumer behaviour continues to change the options to respond to online copyright infringement will likely have to change. We will be working closely with other countries to get a better understanding of levels of online copyright infringement and the effectiveness of different approaches to respond to the problem. In light of this, the Government will review the effectiveness of efforts to reduce online copyright infringement within 18 months of a code or standard coming into operation. We strongly urge all parties to approach these discussions in good faith and in keeping with the common goal of reaching an agreement, without delay. It is better that this exercise be undertaken consensually, rather than prescriptively. We have also written to rights holders, ISPs and consumer groups to inform them of the Government’s decision. December 10, 2014 - Children exposed during pregnancy to elevated levels of two common chemicals found in the home--di-n-butyl phthalate (DnBP) and di-isobutyl phthalate (DiBP)--had an IQ score, on average, more than six points lower than children exposed at lower levels, according to researchers at Columbia University's Mailman School of Public Health.